Explanation: What is causing the picturesque ripples of supernova remnant SNR 0509-67.5? The ripples, as well as the greater nebula, were imaged in unprecedented detail by the Hubble Space Telescope in 2006 and again late last year. The red color was recoded by a Hubble filter that left only the light emitted by energetic hydrogen. The precise reason for the ripples remains unknown, with two considered origin hypotheses relating them to relatively dense portions of either ejected or impacted gas. 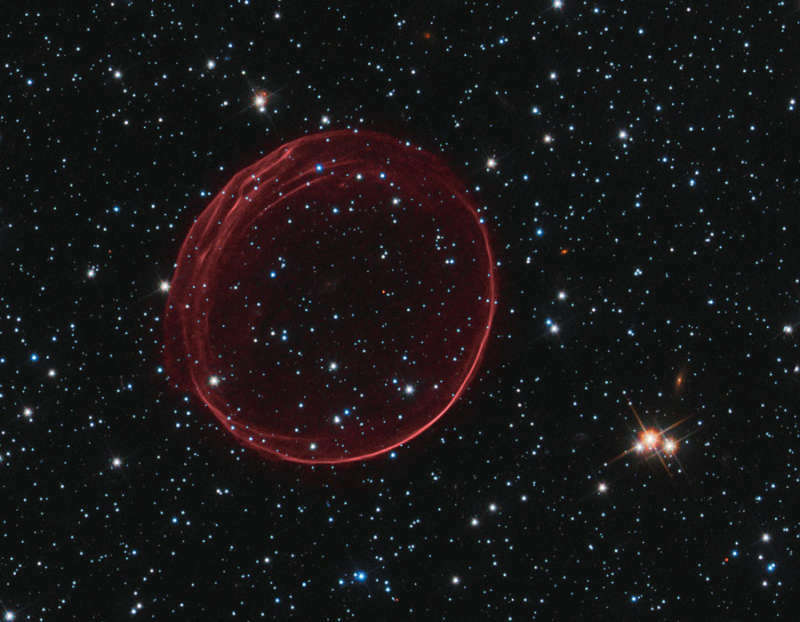 The reason for the broader red glowing ring is more clear, with expansion speed and light echos relating it to a classic Type Ia supernova explosion that must have occurred about 400 years earlier. SNR 0509 currently spans about 23 light years and lies about 160,000 light years away toward the constellation of the dolphinfish (Dorado) in the Large Magellanic Cloud. The expanding ring carries with it another great mystery, however: why wasn't this supernova seen 400 years ago when light from the initial blast should have passed the Earth?